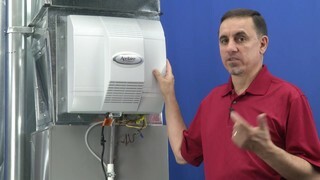 Hi, I'm Jay, and this is the Aprilaire 700, power style humidifier. Maintenance on it is going to be very simillar to any of the powered humidifiers. The 700, 768, 760, even the 110 and the 112. So the first thing we are going to do, is kill the power and the water to this unit before we do anything. Find the saddle valve, turn it clockwise, until it stops. Alright, let's take the cover off. On the bottom of this particular model, there's a latch. We're going to pull down on it, pull out, and then lift up, to get if off of the hooks on the top. Now we're just going to set this part on the side. Alright, this is the evaporator pad, we're just going to take it, and pull it out with our hands. Alright, you can snap this apart, take this evaporator pad, throw it away. You're going to rinse off the water distribution tray, and this frame, which is called the scale control insert. They just get washed and rinsed off. Then you put the new pad in, put the top back on, snap it together. Now this particular model happens to be directional, there's a little groove here that has to go in first, through the back side. Just go like this, slide it into place, and we're going to put the cover back on. On this cover, there are little hooks, here and here, they go in first. So this part is the top. So what you do is you angle it up, like this, get the top hung on there, push the bottom in, and shake to make sure that this thing is latched on. You don't want this thing falling off in the middle of the night. So, it's back on there, and the only thing we have to do now is turn the power and the water back on and test it. Aprilaire 768MAINTKIT Humidifier Model 768 Maintenance..